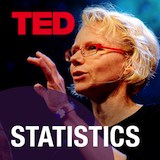 Prof Robin Lock and Patti Frazer Lock, St. Lawrence University; Dr Kari Lock Morgan and Dr Eric Lock, Duke University; Dennis Lock, Iowa State University frame the TEDtalks in the context of the art and science of visualizing data, and its place in the field of Statistics. Watch the 2010 TEDTalk "David McCandless: The beauty of data visualization." In the information age, "data is the new soil," proclaims David McCandless. The journalist-turned-designer works this soil-whether it's military spending or Facebook status updates—to harvest visualizations that interweave information in surprising ways. Watch the 2006 TEDTalk "Hans Rosling: Stats that reshape your worldview." Statistics guru Hans Rosling is on a mission to liberate and animate publicly-funded data. In this phenomenally popular and playful TEDTalk, Rosling's interactive representations invigorate decades of data on child mortality, fertility rates, GDP and more to debunk myths about the developing world. Watch the 2011 TED talk "Nathalie Miebach: Art made of storms". Artist Nathalie Miebach weaves with reeds and beads to display weather data in three-dimensional space. Miebach's sculptural forms are amalgamations of data on temperature, wind speed, barometric pressure, cloud cover and other storm stats. The result? Weather statistic-driven soundscapes and musical scores like nothing you have ever heard before. Watch the 2008 TEDTalk "Chris Jordan: Turning powerful stats into art." Photographer Chris Jordan makes mammoth numbers more meaningful through images that help us grasp the scale - and often the perversity - of Western culture. His large-format, long-zoom artwork gets gallery-goers thinking about the rates of incarceration, cosmetic surgery, plastic cup use and more. Watch the 2007 TEDTalk "Blaise Aguera y Arcas demos Photosynth." Rated one of TED?s "most jaw-dropping" talks, this demo of Photosynth by Microsoft's Blaise Aguera y Arcas shows how we can analyze and synthesize vast amounts of visual data. Photosynth facilitates detailed map-making and virtual tours built entirely out of spatially-related images scraped from social media sites. Aguera y Arcas argues this is nothing short of "taking data from everybody, from the entire collective memory of what the Earth looks like, and linking all of that together." Watch the 2011 TEDTalk "Deb Roy: The birth of a word." MIT Media Lab veteran Deb Roy takes home videos to an entirely new level: Roy wired his house with video cameras in order to analyze how his infant son learned language. In parsing more than 90,000 hours of footage, Roy builds stunning visualizations of the spatial and temporal aspects of acquiring new words. Then Roy and his team repurposed the same techniques to illuminate the engagement properties of social media content, drawing from billions of feeds. The Locks' summary essay will highlight some trends and unanswered questions in the disciplines of statistics and data visualization, and the concluding activities will help you synthesize the content and apply what you've learned.